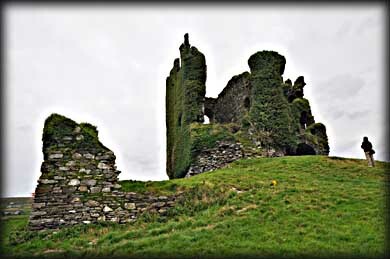 Situated on a grassy hill commanding clear views over the coastal channel to Cahersiveen, this McCarthy Mor Castle was constructed in the 16th Century on the site of an earlier 14th century structure. It is a very impressive rectangular structure with a projecting corner tower. The three vaulted ground-level chambers have corbels at second story height suggesting large halls on the first floor with same-size vaulted rooms above each of them. Two of the three chambers are missing the southern facing wall and are thus open to be explored. There is one storey above the vaulted roof of the main structure, with two rooms. The larger room contains a large, possibly three-light window plus a slightly smaller window to the east. The second room (behind the wall) has another large window. There are remains of a 4th storey in the attached projecting tower. Two mural staircases climb to these levels with another stair in the tower. One stair ascends from the north entrance lobby and was roofed with slabs and lit with three narrow loops set in lintelled, splayed embrasures. These defensive loops are evident throughout the structure and provide the main source of light for the lowest level. The castle was once surrounded by a high wall, but only the west wall and northwest portion of the north wall remains today with a mural stairs within it. 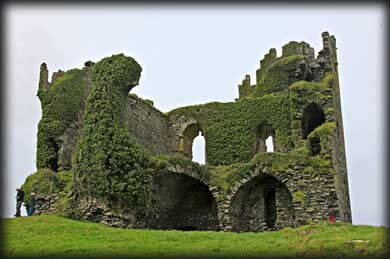 The castle was badly damaged by cannons when attacked by Oliver Cromwell's troops in 1652. There are no entrance fees or any indication that work is being done to preserve the ruins. 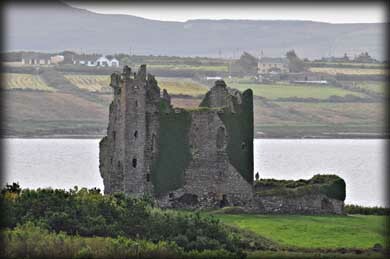 In a sense that is a shame since it is probably the largest castle on the Iveragh peninsula and can easily be seen from Cahergal stone fort. Situated: From Cahersiveen head Northwest on Bridge Street. Feep left at crossroads. 1 K turn left . Follow this road to the castle. Discovery Map 83: V 4473 7981. Last visit Sept 2012.